The TV Series Resurrection Ertugrul broke records in Turkey and the Middle East. Available on Netflix the show teach us about the history of the Ottoman Empire and the true meaning of being Muslim. Turkish actor Engin Altan Duzyatan on the set of Netflix TV series Resurrection Ertugrul. The warrior’s lament, mixed with the sound from the strings of an Arabian guitar. A sword, in which the ancient inscriptions lie on rusty iron, emerges from the darkness and crosses impetuously over an old and waving flag. That is, in short, a brief trailer description of one of the most watched television series in Turkey and the Middle East. “Dirilis Ertugrul” in Turkish, or “Resurrection Ertugrul” as it appears in Netflix, where the story of the father of Osman the First is depicted, whom was the founder of the Ottoman Empire. According to the series, the life of this epic character was marked by great challenges in the 13 Century that involved long nomadic migrations of the Kayi Tribe, from territories settled in what is known today as Iraq, Iran and Syria. Not to mention the fierce wars that ancient Turks had to face with Mongols, Crusaders and the Byzantine Empire. The series is rich in the reconstruction of historical details, to the point of preserving the names of characters that really existed. In addition, it handles with great care the description of daily life, folklore, economy, commerce, gastronomy, as well as festivities and handicrafts famous for its Persian rugs. The series weaves the story of a hero by intertwining him with a very deep explanation of the Koran’s passages, allowing the spectators to have a real approach to what the Islam is in its essence. The series fulfills a clear objective of educating an audience about the real meaning of being a Muslim. Even though, religious and philosophical content, are just one of the many elements that we find in the series. With a large dose of political intrigue and betrayal of all levels, the series explains how the balance of the powers was distributed in the ancient world. Those who like action, get ready because this series has been made to make us feel pure adrenaline in each chapter. The bad guys become good, the good ones become bad, and friends become enemies and enemies allied. With unexpected twists, sometimes unprecedented and sometimes disappointing, the series presents us the beginnings of an empire that lasted 6 centuries. The powerful photograph of this series, takes us in an aerial tour of the geography of Turkey, and shows us wild Arabian horses galloping with warriors of antiquity for whom the expansion of the Islam was their duty. Dirilis Ertugrul transports us, in each chapter, to the genesis of an Ottoman Empire, which culminated 10 decades ago when the First World War sparked. Here, no matter what happens in our real world, art and history come together to break the boundaries of politics, religion, time and space, especially today when, Turkey and the United States are facing difficult moments in the diplomatic arena. Tensions that have been increase due to the role of the US in the Syrian War and the new immigration rules in the United States that has been affecting a large Muslim community. Engin Altan Duzyatan is the Turkish actor who gave life to Ertugrul, a hero that today remains alive; he appears in the coins of the Turkish currency. 1. 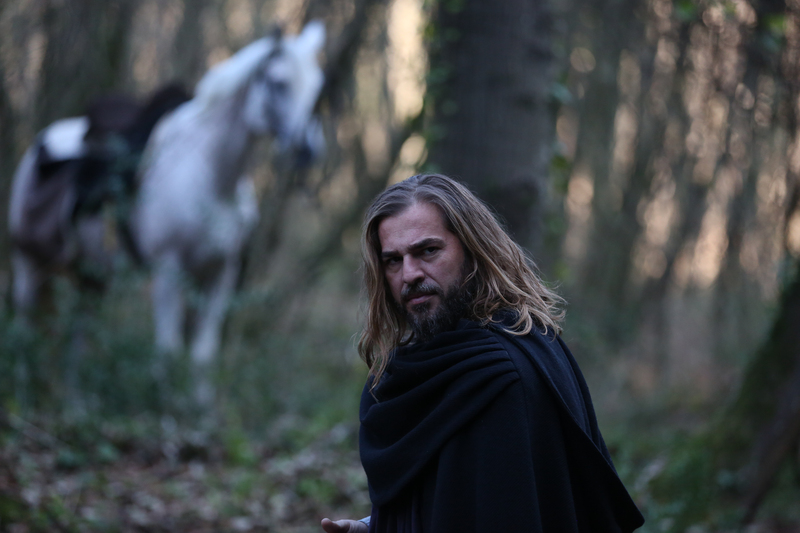 As a talent, how was for you the experience of playing a powerful character like Ertugrul? Ertuğrul is a very important character for our history and actually for whole world. He was the father of Osman Gazi, founder of Ottoman Empire, which ruled the world for 600 years. And, actually, we do not have too much sources about that era. Our sources are just about 7 pages. So, we have been trying too hard to find other sources that allowed us to learn more of that era. We know that he was a real hero. For him, the limits were not an obstacle. He was the first one who tried to live settled life instead of nomad life. He fought for justice. If I may say so, he laid the foundations of Ottoman Empire. So my experience as playing Ertuğrul role is priceless. 2. How difficult was for you to give live to an emblematic and historical character? Before the shootings, as I mentioned you above, the production team and I, also, searched all sources about the era and Ertuğrul. I first had to understood Ertuğrul and what he stood for. So it wasn’t just physical training like horse riding, sword or archery, I also studied him mentally. And after we started practicing horse riding, sword and archery like 5 months. I spend a lot of time with the actors who are playing my heroes because Ertuğrul and his relationship with his heroes must be real when we start shooting. In the Ertuğrul history, he cared a lot for his people, especially, for his brothers in battle. The preparation was hard but it was a big pleasure for me playing the Ertuğrul role. 3. Dirilis Ertugrul is an impeccable production, with a very moderate use of special effects. Something that keeps my attention is the way in which the historical events has been recreated. Do you think that this series can help people around the world to end the lack of knowledgement and understanding about your culture? We use the latest technology during our shootings. And also, as you mentioned before, we use special effects like every other big Hollywood productions. If you want to compete with the world, you have to act like them and use all their technology for making things better. And also, for our action scenes we have a big Stunt Team called NOMAD. Many Hollywood movies use this crew for their fight scenes or trained by them for their fight scenes. We did the same thing, from the beginning of the first season, we started working with them and they trained us in sword, archery, combat, and horse riding. So, when you do the right things, success comes with it. We were shooting the 13th century, this century could show our roots but it is not reflecting our present-day culture. We are telling the story of around 700 years before. 4. The series is rich in diversity of characters and it has a very deep religious and philosophical messages. Those messages had any impact in your personal life? No, because I’m an actor and when my set finishes I am Engin Altan Düzyatan. I have my own opinions and ideas. The opinions or facts, which are telling in the Series, I didn’t learn them for the first time, I had already known this ideas or believes and I have a huge knowledge about them. 5. The series describes, in a very pure way, details about religion and the Koran. Do you think that that could help to educate people positively about what it really means to be a Muslim? Islam is a religion of peace and justice. If we can show this a little, that means we are doing it right. 6. Last October Dirilis Ertugrul started its 4 season in Turkey. What we will see in the new season? For forth season Ertuğrul is now the margrave of Anatolian Selçuklu Empire. We are seeing that other nomads started to join around Ertuğrul because of his believes regarding justice. We are going to tell the growing of Ertuğrul, his actions and wars for protecting and enlarging the lands of Anatolian Selçuklu Empire. 7. Your acting style remember me Marlon Brando. And I’m daring to say that you are some kind of Marlon Brando in Turkey. Do you agree? I, like everyone, I think that Marlon Brando was a great actor, so thank you for your compliment. My acting professor made same compliment to me at college. It is an honor for me hearing the same compliment again from your side. 8. Let’s talk about of your social advocacy in Africa. We know you are providing clean Water to a half million people. How that project has been run, when did you started and what it motivates you to help? I like to shoot wild life photos so, I decided to visit Africa, it was in 2013. When I was there I had a chance to inspect the water problem in the whole region. Actually, Africa has water resources but they do not have any tools to drill for water and poverty is too much, so people can’t reach to a clean water supply. The percentage of people who can’t reach to a clean water supply is 53% and every 3 children of 10 are dying before the age of 5 because of the diseases caused by dirty water. Nowadays, the human race nearly has been expending the water supplies; a whole region can’t find clean water to drink. I can’t accept this. And for the next 30 years, many countries, including Turkey, are going to face with the danger of lack of water. So, I felt that I have to do something. It might not be a big thing but it is something. So, I decided to make an exhibition with the photos, which I shot in Africa, sell them and use the revenue for opening clean water supplies in Africa. The number we can reach is now 100,000 but we wish to reach the numbers you mentioned. 9. What is your life purpose right now and how are you planning to achieve it? With this project our boarders enlarged even more. We are the second country after US exporting TV Series to the world. It would be pleasant to show a Turkish Actor’s success by taking place in foreign countries projects. For Ertuğrul, we are shooting this project in the world standard. Nevertheless, acting in joint projects or acting in a complete foreign project can be a good objective. The world is smaller now, our first episode has 1 billion clicks in YouTube and this is an example of how high and good quality work we are doing, so why not we show this success to the world and why not in a Hollywood project. 10. Any plan to visit US in the next months? Yes, on August I am planning to visit US. Adriana Aristizábal is an award winning journalist, Best-Selling author and a former war reporter from Colombia. In the late 90’s she provided live coverage of the war between the FARC, Paramilitaries and the Colombian Government from the front-lines. In 2003 she published the best-selling book La Guaca de las FARC (‘FARC’s Stash: I Found It’) published by Quintero Editores. The book tells a true story about a group of soldiers who stumbled upon millions of dollars stashed in barrels. They decided to run away with the treasure, which belonged to a notorious terrorist group. In 2004, after receiving threats from the toughest FARC Leaders, Adriana secured a new a opportunity to work for the Colombian Consulate in New York City. Currently, Adriana is News Anchor & Reporter at NY1 Noticias and contributing writer for Thrive Global. She has been a guest speaker at top Universities across the United States. Last May she was invited as speaker to the 50th Fortune - Alpha Most Powerful Latinas event at Columbia University.